Being faced with choosing just one spice is even harder than being asked to name my favorite herb, but coriander is the one I reach for more than any other. It's one of the most universal spices, having an important place in cuisines from around the world and meshing with an enormous variety of flavors, from savory to sweet. It also thrills me that I can grow and harvest coriander in my own Seattle backyard, unlike the majority of spices that will only grow in tropical climates. Coriander and cilantro come from the same plant, Coriandrum sativum, a short-lived annual in the parsley family. Most commonly we refer to the leaves as cilantro and the seeds as coriander. The seed has an intensely nutty aroma with hints of orange and lemon. Traditionally coriander is added to everything from Indian curries to pastrami to pound cake. I add it to spice rubs for pork, duck, and fresh tuna, to vegetable dishes along with ginger and fennel, to soups, dressings, pickles and chutneys, and I add hints to baked goods from orange scones or coconut cake. If your recipe calls for ground coriander, always buy whole seed and grind it yourself, as it begins to lose its fragrance within a day. All spices change their flavor if toasted, but I find this to be especially true for coriander. Dry-toasting the seed brings out a much deeper, richer flavor that I especially love with potatoes, as in this soup. Jerry was executive chef at the highly acclaimed Herbfarm Restaurant from 1990 to 2007, where he garnered national attention for his seasonal Northwest menus and his expertise in the subject of culinary herbs. In 2000, he won the James Beard award for Best Chef: "Northwest / Hawaii". Jerry is the author of two award-winning cookbooks, The Herbfarm Cookbook, and The Herbal Kitchen. He has been featured in The New York Times Magazine, Food and Wine, Bon Appetit, Gourmet, Fortune, and many other publications and he has appeared on Martha Stewart Living, Better Homes and Gardens Television, and The Food Network. Chef Traunfeld's potato soup with toasted coriander perfectly showcases the citrusy-nutty personality of coriander. 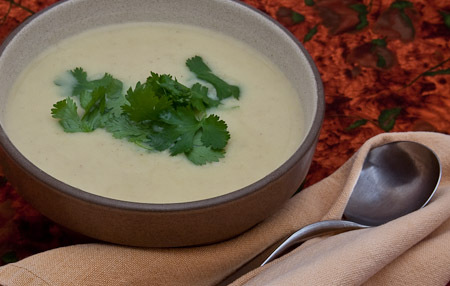 Though creamy, the soup is still light with the coriander and orange adding a bright refreshing flavor that pairs perfectly with a beautiful summer day; it can even be served chilled for added summer delight. For a soup that offers such intriguing layers of flavor, it's easy and quick enough to make that it could be served for dinner any night of the week. It can be made in one pot and if you use an immersion blender rather than a traditional blender, there are even fewer dishes to wash. In contrast to the nutty flavors the toasted coriander brings to the soup, the Orange-Coriander Scones use untoasted coriander lending a lighter more delicate coriander flavor and aroma. 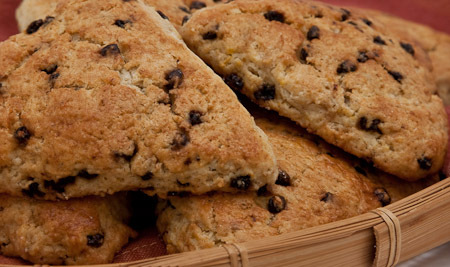 The coriander and orange match each other equally in these scones, never letting one fully dominate the other. It's more of a back-and-forth play of flavor between the familiar and unusual; the orange never lets you get too lost and the coriander never lets you get too complacent. I like making scones in the morning because they are faster than muffins (especially if you embrace power tools and zip the dough together in a food processor), and don't require constant tending like pancakes and waffles. As a kid I did not like coriander. I should clarify; I didn't like biting into whole coriander seeds as my mouth was happily enjoying spaghetti nestled in a rich tomato meat sauce. The startling crunch would release a very strange and unpleasant flavor experience. I quickly figured out the flavor offender was whole coriander and learned to spot the offensive flavor grenades and flick them to the side of my plate so I could enjoy my spaghetti surprise free. I ignored coriander until well into my adult life. I don't recall when we became friends, but now I can't imagine cooking without it and find myself working it into all kinds of dishes. It could have been Jerry Traunfeld's first book, The Herbfarm Cookbook; it really sparked my interest in experimenting with herbs and spices. The first recipe I made from the book was Lavender Shortbread, and I still remember the sensation of discovery when I first tasted it. It was a discovery of the idea that herbs and spices can be a driving element in a dish rather than just tentative little pinches of flavor hiding in the background. Jerry Traunfeld's latest book, The Herbal Kitchen, Cooking with Fragrance and Flavor has been just as inspiring. One of my favorite dishes in this book is Cinnamon Basil Chicken; chicken simmered in a tomato sauce richly flavored by cinnamon stick, star anise and fresh ginger and finished with fresh basil. Both of these books are listed in the Essential References resource on our site. Not only are they wonderful cookbooks, but they contain a wealth of information on understanding the flavors of herbs as well as expert advice on how to grow them in your garden. At his restaurant, Poppy, Chef Traunfeld embraces his love for cooking with herbs and spices and creates a new menu each day that celebrates this passion. His talent for highlighting an ingredient with just a hint of spice, or creating a dish that stars an herb, will no doubt dazzle your palate and maybe even lead you to a new flavor discovery.